A water heater is one of the essentials in many homes, especially if you live in a place where it is often chilly. These days, traditional water heaters are no longer as preferred, basically because they are costly and use a lot of energy. 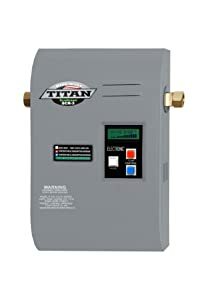 With this, tankless water heaters are offering the perfect alternative, especially those that are made by Titan. If you are on the lookout for the best Titan tankless water heater, this guide is for you. I will be sharing valuable insights that will help you to understand tankless water heaters and more importantly, I will identify four of the top models that are available today. Perfect for medium-sized homes, this my personal top pick within the product category. With its continuous heating capability, hot water is available on demand. This cuts the time that you need to spend waiting before hot water is ready. As per the specifications from the manufacturer, this is best for areas where there is warm temperature, with a ground water temperature that is at least 65 degrees Fahrenheit. This is a model that is also known for its space-saving benefits. Even if you have a small bathroom, there is no need to worry. Given its compact size, you can be confident that it will fit as it does not require too much space. It is also known for being user-friendly, specifically in terms of installation. You need to use a .5-inch pipe, which is the standard size. The manufacturer also offers comprehensive manual to provide the instructions that you need to follow. In terms of durability, it has copper and brass casing. This is a good material as it can resist wear and tear that can result from mineral deposits filtered from the water. At a flow rate of one gallon per minute, the temperature of the water is raised to 81 degrees Fahrenheit. On the other hand, when it becomes four gallons per minute, the temperature is reduced by 20 degrees Fahrenheit. Nonetheless, there are also drawbacks that you can experience from this tankless water heater. The display is not as user-friendly and you might end up being confused with what it shows. There are also instances wherein you need to reset the heater. One of the first things that you will notice in this tankless water heater is how it comes with an expensive price. If you are budget-conscious, stay away as there are more affordable options available. Nonetheless, if you do not mind splurging, this is worth your consideration. Looking at its features, one of the most noticeable is the digital temperature display, which is one of its biggest differences from the older models. Because of this, you can easily see how hot is the water that it dispenses. If you want peace of mind, it is also good to know that the manufacturer is offering warranty for ten years. This warranty covers the casing and the components that are responsible for carrying water. The manufacturer also specifies that it is made from all-steel and brass. The latter is the one that is responsible for its durability, making sure that it can survive many years of use. This is one thing that is important when you have hard water and when there are too many impurities that the heater can trap. One problem with this model, however, is that it may not be as popular. If you go online, minimal reviews are available, making it hard to validate the claims made by the manufacturer. From condos to motorhomes, this tankless water heater will make a great choice for compact spaces. It might be small, but comparable to other tankless water heaters, never underestimate its capabilities. This model is equipped with a manually resettable thermostat, which provides the users with the quick ability to reset the temperature when water starts feeling a bit cold. The air/water deferential analyzing system is another innovative feature that you can find in this product. The latter is the reason why the unit produces fewer dry starts. The manufacturer incorporates a dedicated digital microprocessor in this unit. It samples the temperature of water 21 times per second, making sure that it will be hot when it is dispensed. This is also the one that makes sure of the stability of water. A lot of users, however, can end up being skeptical about this product primarily because of the minimal reviews that are available. You will find it difficult to look for actual users who are sharing their experiences in using this tankless water heater. If you live in a place with a cold climate and if taking a shower seems like too much of a burden for you, this water heater can be a lifesaver. It has a heating capacity of 27 watts, higher than the products reviewed above. With this, water is heated quickly. While many of its competitors from other brands are made from flimsy plastic, this model comes with a stainless steel body. This makes it less prone to wear and tear, even with long-term use. This product is made not only for the shower, but for other places that need hot water on demand. If you have a whirlpool or a garden tub, this can also be effective in providing heated water. For the protection of its internal components and to ensure longevity, it also has a manually resettable thermostat and dual micro-temp thermos-fuse. 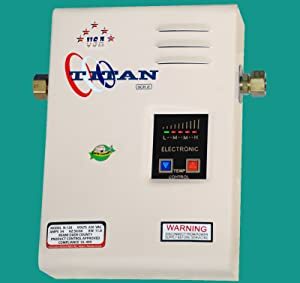 Compared to the three tankless water heaters from Titan that have been discussed above, this is not only the most expensive, but it is also the one that consumes the highest energy. This can translate to huge costs in the long run. If your home is small, this heater is not for you. Energy Savings: If you want to enjoy energy-efficiency, go tankless in your water heater. Operating costs will surely be lesser, basically because it produces hot water only when you need it. Space Savings: If space is an issue, you have another good reason to choose a tankless water heater. They can fit even in tight spaces. Many of them can even be used in motorhomes. Durable: Although this will depend on the specific product that you will pick, in a general sense, tankless water heaters are long-lasting. In fact, the average life expectancy is from 10 to 20 years. Affordable: This benefit is in comparison to a water heater with a tank. Most of the models that you can find in the market have reasonable prices, especially those from Titan. The bigger and more powerful ones, naturally, are more expensive. Ease of Installation: There is no need to get in touch with the pros and pay them for their services. Most of the models are easy to configure and are packaged with almost everything that you will need to complete assembly. Size: There are different factors that will determine which size is the best for your needs. The number of baths that will be supplied by the hot water and the size of the available space will help you choose which size is the best. Durability: For the best value for money, look for a Titan tankless water heater that is made from high-quality materials. From the exterior to the internal components, they should be made from materials that can withstand the test of time. Technical Specifications: You also need to deal with the technical details to differentiate the options. Look at specs like wattage and amperage to gauge the performance of the product. If you have a small house, on the other hand, you do not need one that is too powerful. Energy Consumption: Speaking of the technical details that you have to evaluate, consider how much energy it consumes when it is used. The wattage will determine this. The goal is to look for one that is energy-efficient without the need to compromise performance. Safety Features: Some of the most important features that will ensure the safety of the tankless water heater include protection from surge, overheating, and freeze. They should also be made from high-quality components for safe operations. Warranty: This will provide you with peace of mind. Most of the products from Titan have ten years warranty, but they cover only the case and some components. Be sure to follow the terms and conditions to avoid the warranty from being voided. Remove limescale from the heater with the use of natural and non-toxic materials. A mixture of water an undiluted white vinegar will be an excellent choice. It removes the build-up of impurities, making sure that the water is clean. Before you start cleaning the heater, make sure that the supply of energy is turned off for safety purposes. Consult the manual from the manufacturer and religiously follow the instructions that are specified when it comes to how to clean your tankless water heater. Make sure that the internal components are protected, especially from the water. The casing should be properly enclosed so that the wires and other parts will not get wet. Pay attention to the quality of the water as well. It will help if you will install a water softener. This way, there will be lesser impurities. A water filter may also be needed if in case your tankless water heater does not come with it. Perform a regular inspection of the water heater. By being able to spot a problem and repairing it sooner, you can prevent the problem from escalating. 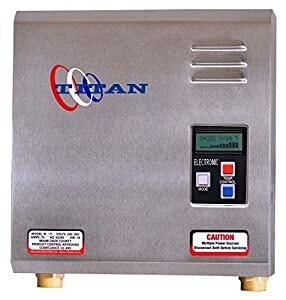 Now that you have reached the end of this guide for the best Titan tankless water heater, I hope that it is easier for you to make the right decision. Consider factors like efficiency, price, energy consumption, and output as you try to narrow down the possibilities. 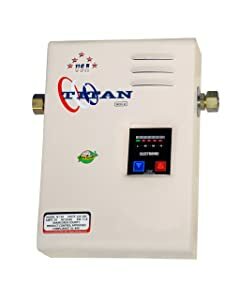 Do you own a tankless water heater from Titan? Is there anything that you would like to share? Do not hesitate to leave a comment below.